Kimbap is Korea's version of a sushi roll...but not really because Korea is not Japan and sushi is Japanese. 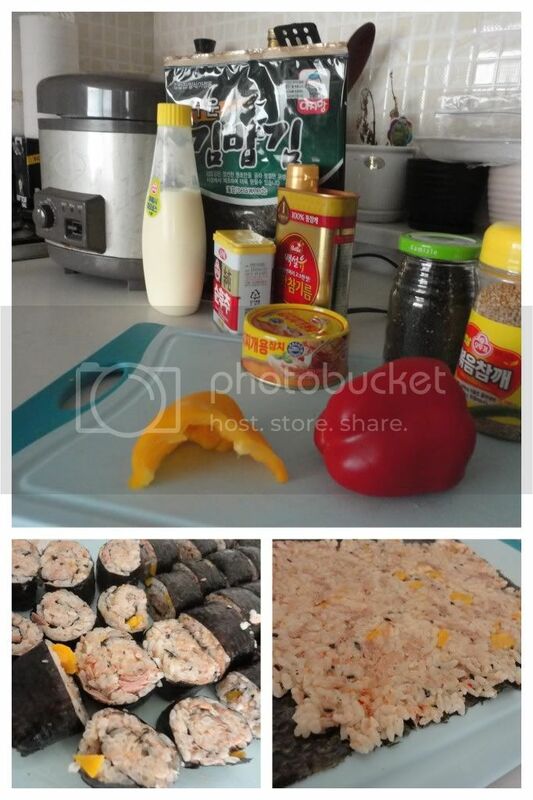 So kimbap is a Korean snack/quick dish of rice and things wrapped in seaweed. Typical Korean Kimbap includes ham, egg, pickled radish and other non-Japanese style additions. It's cheap and perfect for so many situations. Once, in desperate need of a quick dinner, a Korean friend recommended a twist on traditional kimbap...I'm calling it Kimbap in a Pinch. Prepare rice. White rice. (One cup of un-prepared rice will be enough for about 4 rolls once it's been properly prepared). Mix in mayonnaise, a touch of sesame oil, drained tuna fish, a veggie of choice (I used bell peppers), and some sesame seeds. Spread onto a sheet of seaweed ('kim' in Korea, 'nori' elsewhere). Mayonnaise, chopped tomato, chopped bacon, salt and pepper (B.S.T. - Bacon, seaweed and tomato) Quite amazing, trust me. Mayonnaise or a touch of salsa/hot sauce, black beans, corn and tomatoes -- haven't tried this, could be a total fail. Hard-boiled and chopped egg, mayonnaise, salt and pepper (think egg salad in a sheet of seaweed) -- also, haven't tried but definitely think there's potential! Whatever you can think of! Kimbap is the new sandwich my friends, go out, experiment and have a grand ole time.